Many years ago, more or less by accident, I came across the riverside walk north from Greenwich on the south bank of the Thames. This was before there was an official ‘Thames Path’ and there were few books containing routes of walks, certainly very little written in any way about areas such as North Greenwich, then a mix of industrial sites, some derelict and other waste land. Of course the footpaths were familiar to locals, many of whom used them on their way to work. But those people who walked for leisure made their way to the greener heights of the North Downs or the wooded areas around London, rather than the grimier regions. Few of the people I showed the pictures I was taking then appreciated them. At the camera club the judges would largely scratch their heads and wonder why anyone had bothered to take photographs in such places. 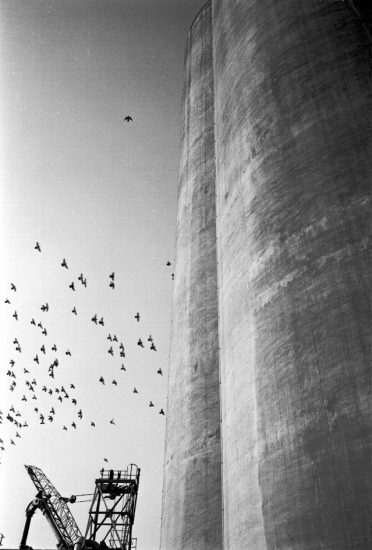 But I was very aware that we were in a time of rapid transition, moving from being a country based on manufacturing to one depending on services, and that was being accelerated by government policies, and wanted to photograph the process. The result of this was a project called London’s Industrial Heritage, which became a web site of the same name towards the end of the 1990s. The web design was by my elder son as a surprise birthday present, and generated the site from a set of images and a database file of their captions and locations. It was an ingenious solution, relying on some very long strings in the URLs, but also visually simple and elegant. You can use the interface to select pictures in various ways, and one is by area; of the 23 pictures now on the site, around a dozen are from the riverside walk between Greenwich and the dome at North Greenwich. I had been taking pictures at Lewisham at lunchtime, and wasn’t due in central London for another event until 5.30pm, so it seemed an ideal opportunity to visit the riverside walk again, as I’d heard that a part of it which had been closed for some time had reopened. So I took the bus from Lewisham to North Greenwich. Walking down Drawdock Rd to the Thames, it became clear that the section south from here was still a building site, and the path still closed. 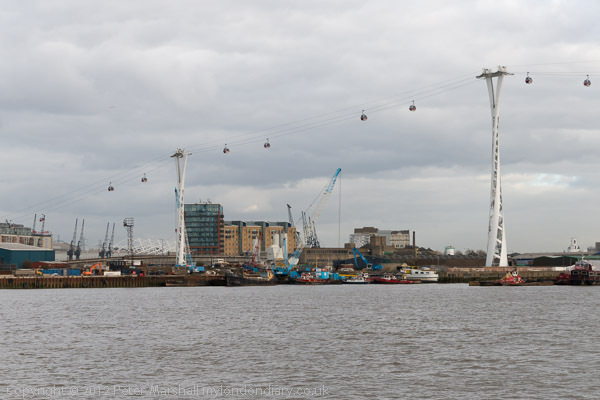 I took a little walk along the path around the Dome, until I could get a view of London’s most expensive river crossing, the ‘Dangleway’ or cable car service between North Greenwich and the Royal Victoria Docks. I’d decided I didn’t quite have the time to take a ride across (and without my Oyster or a Travelcard it would have been a bit expensive) so I turned around and took the Thames path back into Greenwich – around 3 miles. From Drawdock Rd going south there is at the moment a fairly dull detour by road until you reach a footpath leading back to the river, still helpfully marked as closed by the local authority. Fortunately I had more up-to-date information, and was also able to confirm from a couple walking out of the path that it was now open all the way south to Greenwich. In 2002 the area had already become a curious landscape of sand and gravel, and the only change over the next 11 years seems to have been the weather, as you can see from the picture below. 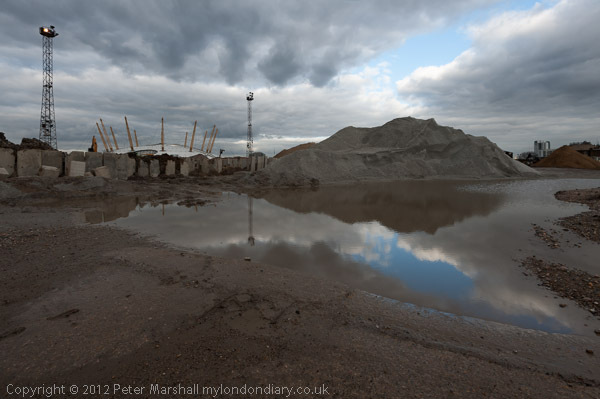 This image seems somehow to have got a little darker than I made it – but you can see it and the others from the walk on Thames Path Greenwich Partly Open. 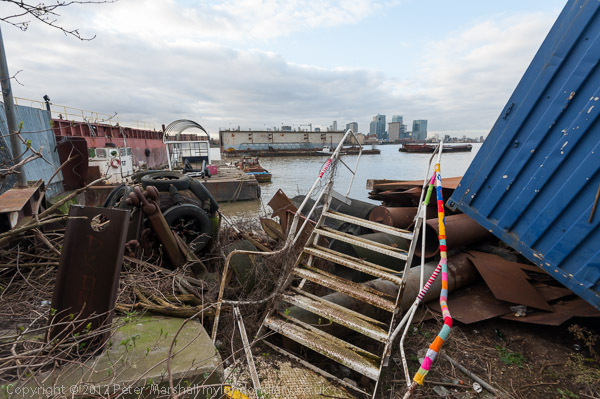 One recent edition to the path are a number of works by Greenwich Guerillas Knitters. This entry was posted on Saturday, February 23rd, 2013 at 07:42 pm and is filed under My Own Work, Photo Issues, Political Issues. You can follow any responses to this entry through the RSS 2.0 feed. You can leave a response, or trackback from your own site.